Definition at line 11 of file cardregion.h. Definition at line 14 of file cardregion.cpp. Definition at line 62 of file cardregion.cpp. Definition at line 281 of file cardregion.cpp. Referenced by CardWindow::Update(), and CardWindow::WndProc(). Definition at line 77 of file cardregion.cpp. Referenced by PrepareDragBitmapsThreed(), and Update(). Definition at line 72 of file cardregion.cpp. Definition at line 141 of file cardrgnmouse.cpp. Referenced by OnLButtonDown(), and SimulateDrag(). Definition at line 185 of file cardrgnmouse.cpp. Referenced by OnLButtonUp(), and SimulateDrag(). Definition at line 84 of file cardregion.h. Definition at line 279 of file cardrgnmouse.cpp. Definition at line 208 of file cardrgndraw.cpp. Definition at line 344 of file cardregion.cpp. Definition at line 322 of file cardregion.cpp. Definition at line 399 of file cardregion.cpp. Referenced by CanDrop(), DeckClickProc(), MoveCard(), OnLButtonUp(), RowStackDblClickProc(), RowStackDropProc(), StackDragProc(), and StackDropProc(). Definition at line 69 of file cardregion.h. Definition at line 273 of file cardregion.cpp. Referenced by DeckClickProc(), RowStackClickProc(), RowStackDragProc(), StackDragProc(), StackDropProc(), and TurnStackCard(). Definition at line 76 of file cardrgnmouse.cpp. Referenced by ClickRelease(), OnLButtonDblClk(), and OnLButtonDown(). Definition at line 120 of file cardregion.cpp. Definition at line 361 of file cardregion.cpp. Referenced by PileClickProc(), RowStackClickProc(), StackDropProc(), and SuitStackClickProc(). Definition at line 65 of file cardrgnmouse.cpp. Definition at line 245 of file cardregion.cpp. Definition at line 552 of file cardregion.cpp. Definition at line 477 of file cardregion.cpp. 498 //instead of this ones!! Referenced by PlayCard(), and SimulateDrag(). Definition at line 424 of file cardrgnmouse.cpp. Referenced by OnMouseMove(), and ZoomCard(). Definition at line 82 of file cardregion.h. Definition at line 544 of file cardregion.cpp. Referenced by PileRemoveProc(), RowStackClickProc(), RowStackDragProc(), RowStackDropProc(), StackDragProc(), StackDropProc(), and TurnStackCard(). Definition at line 218 of file cardrgnmouse.cpp. Definition at line 228 of file cardrgnmouse.cpp. Definition at line 287 of file cardrgnmouse.cpp. Definition at line 378 of file cardrgnmouse.cpp. Definition at line 583 of file cardregion.cpp. Definition at line 91 of file cardregion.h. Definition at line 92 of file cardregion.h. Definition at line 379 of file cardrgndraw.cpp. Referenced by MoveCard(), and OnLButtonDown(). Definition at line 503 of file cardrgndraw.cpp. Definition at line 88 of file cardregion.h. Definition at line 89 of file cardregion.h. Definition at line 618 of file cardrgndraw.cpp. Referenced by PlayCard(), RedrawIfNotDim(), RowStackClickProc(), and TurnStackCard(). Definition at line 611 of file cardregion.cpp. Referenced by MoveCard(), OnLButtonUp(), and SimulateDrag(). Definition at line 606 of file cardrgndraw.cpp. Referenced by MoveCard(), and OnLButtonUp(). Definition at line 253 of file cardrgndraw.cpp. Referenced by CardWindow::Paint(), and Redraw(). Definition at line 86 of file cardregion.h. Definition at line 197 of file cardregion.cpp. Referenced by CreateSol(), and CreateSpider(). Definition at line 384 of file cardregion.cpp. Definition at line 67 of file cardregion.cpp. Referenced by CardWindow::CreateRegion(), and CardWindow::SetBackColor(). Definition at line 390 of file cardregion.cpp. 392 //make a complete copy of the specified stack..
Referenced by DeckClickProc(), MoveCard(), NewGame(), OnLButtonUp(), PileRemoveProc(), and StackDropProc(). Definition at line 182 of file cardregion.cpp. Definition at line 187 of file cardregion.cpp. Definition at line 192 of file cardregion.cpp. Definition at line 146 of file cardregion.cpp. Definition at line 164 of file cardregion.cpp. Definition at line 366 of file cardregion.cpp. Definition at line 258 of file cardregion.cpp. 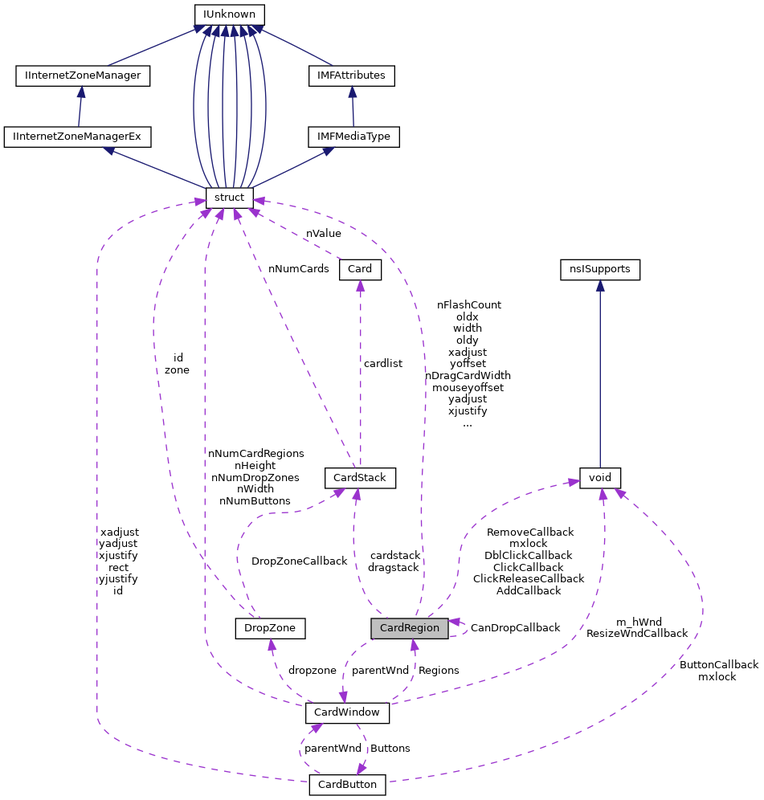 Referenced by CreateSol(), CreateSpider(), NewGame(), RowStackClickProc(), and TurnStackCard(). Definition at line 228 of file cardregion.cpp. Referenced by DeckClickProc(), NewGame(), and PileRemoveProc(). Definition at line 250 of file cardregion.cpp. Definition at line 234 of file cardregion.cpp. Definition at line 202 of file cardregion.cpp. Definition at line 215 of file cardregion.cpp. Definition at line 240 of file cardregion.cpp. Definition at line 83 of file cardregion.h. Definition at line 636 of file cardregion.cpp. Definition at line 333 of file cardregion.cpp. Definition at line 94 of file cardregion.h. Referenced by TConsole::DeleteCharacter(), TConsole::InsertCharacter(), and TConsole::InsertLine(). Definition at line 95 of file cardregion.h. Definition at line 569 of file cardregion.cpp. Definition at line 207 of file cardregion.cpp. Referenced by AdjustPosition(), CardRegion(), Clip(), DeckClickProc(), CardWindow::EmptyStacks(), MoveCard(), NewGame(), OnLButtonDown(), OnLButtonUp(), Redraw(), Render(), and SetCardStack(). Definition at line 409 of file cardregion.cpp. 415 //Now apply the face direction rules..
Referenced by MoveCard(), SetFaceDirection(), and Update(). Definition at line 83 of file cardregion.cpp. Referenced by CardWindow::DistributeStacks(), and Update(). Definition at line 553 of file cardrgnmouse.cpp. Definition at line 14 of file cardregion.h. Definition at line 13 of file cardregion.h. Definition at line 207 of file cardregion.h. Referenced by CardRegion(), OnLButtonUp(), SetAddCardProc(), and SimulateDrag(). Definition at line 202 of file cardregion.h. Referenced by CanDragCards(), CardRegion(), and SetDragRule(). Definition at line 203 of file cardregion.h. Referenced by CanDropCards(), CardRegion(), and SetDropRule(). Definition at line 143 of file cardregion.h. Referenced by CalcApparentCards(), Clear(), Clip(), GetCardStack(), GetNumDragCards(), MoveCard(), NewDeck(), NumCards(), OnLButtonDown(), OnLButtonUp(), PlayCard(), Pop(), PrepareDragBitmaps(), PrepareDragBitmapsThreed(), Push(), Render(), Reverse(), SetCardStack(), SetFaceDirection(), Shuffle(), SimulateDrag(), Top(), Update(), UpdateFaceDir(), UpdateSize(), and ZoomCard(). Definition at line 204 of file cardregion.h. Referenced by CardRegion(), OnLButtonDown(), and SetClickProc(). Definition at line 205 of file cardregion.h. Referenced by CardRegion(), ClickRelease(), and SetClickReleaseProc(). Definition at line 189 of file cardregion.h. Referenced by CardRegion(), PrepareDragBitmaps(), PrepareDragBitmapsThreed(), and SetBackColor(). Definition at line 206 of file cardregion.h. Referenced by CardRegion(), OnLButtonDblClk(), and SetDblClickProc(). Definition at line 144 of file cardregion.h. Referenced by MoveCard(), NumCards(), OnLButtonDown(), OnLButtonUp(), PrepareDragBitmaps(), and PrepareDragBitmapsThreed(). Definition at line 186 of file cardregion.h. Referenced by CardRegion(), Clip(), DoFlash(), Flash(), Render(), and StopFlash(). Definition at line 146 of file cardregion.h. Referenced by CardRegion(), NumCards(), OnLButtonDown(), and OnLButtonUp(). Definition at line 183 of file cardregion.h. Referenced by CardRegion(), Clip(), IsPointInStack(), IsVisible(), Render(), and Show(). Definition at line 177 of file cardregion.h. Referenced by CardRegion(), PrepareDragBitmaps(), PrepareDragBitmapsThreed(), and ReleaseDragBitmaps(). Definition at line 179 of file cardregion.h. Definition at line 176 of file cardregion.h. Referenced by CardRegion(), MoveDragCardTo(), PrepareDragBitmaps(), PrepareDragBitmapsThreed(), and ReleaseDragBitmaps(). Definition at line 178 of file cardregion.h. Definition at line 155 of file cardregion.h. Referenced by AdjustPosition(), and GetOverlapRatio(). Definition at line 139 of file cardregion.h. Definition at line 167 of file cardregion.h. Referenced by ClickRelease(), MoveCard(), OnLButtonDblClk(), OnLButtonDown(), OnLButtonUp(), SimulateDrag(), and ZoomCard(). Definition at line 168 of file cardregion.h. Referenced by OnLButtonDown(), OnLButtonUp(), and OnMouseMove(). Definition at line 169 of file cardregion.h. Definition at line 211 of file cardregion.h. Referenced by CanDragCards(), CanDropCards(), CardRegion(), Lock(), UnLock(), and ~CardRegion(). Definition at line 194 of file cardregion.h. Referenced by PrepareDragBitmaps(), PrepareDragBitmapsThreed(), Render(), and SetBackCardIdx(). Definition at line 174 of file cardregion.h. Referenced by CardRegion(), MoveDragCardTo(), OnLButtonUp(), PrepareDragBitmaps(), and PrepareDragBitmapsThreed(). Definition at line 173 of file cardregion.h. Definition at line 193 of file cardregion.h. Referenced by CardRegion(), GetFaceDirection(), SetFaceDirection(), and UpdateFaceDir(). Definition at line 185 of file cardregion.h. Definition at line 181 of file cardregion.h. Referenced by CalcApparentCards(), Clip(), GetNumDragCards(), IsPointInStack(), MoveCard(), OnLButtonDown(), Render(), and UpdateSize(). Definition at line 182 of file cardregion.h. Referenced by CalcApparentCards(), CanDragCards(), CardRegion(), PrepareDragBitmaps(), PrepareDragBitmapsThreed(), RedrawIfNotDim(), SetThreedCount(), and ZoomCard(). Definition at line 170 of file cardregion.h. Referenced by MoveCard(), MoveDragCardTo(), OnLButtonDown(), OnMouseMove(), and ZoomCard(). Definition at line 171 of file cardregion.h. Definition at line 141 of file cardregion.h. Referenced by DoFlash(), Flash(), GetCardWindow(), MoveCard(), OnLButtonDown(), OnLButtonUp(), OnMouseMove(), PrepareDragBitmaps(), PrepareDragBitmapsThreed(), Redraw(), RedrawIfNotDim(), Render(), and StopFlash(). Definition at line 208 of file cardregion.h. Referenced by CardRegion(), OnLButtonUp(), SetRemoveCardProc(), and SimulateDrag(). Definition at line 196 of file cardregion.h. Definition at line 197 of file cardregion.h. Definition at line 191 of file cardregion.h. Referenced by CardRegion(), PrepareDragBitmaps(), PrepareDragBitmapsThreed(), Render(), and SetEmptyImage(). Definition at line 192 of file cardregion.h. Referenced by CardRegion(), GetFaceDirection(), RedrawIfNotDim(), SetFaceDirection(), and UpdateFaceDir(). Definition at line 187 of file cardregion.h. Referenced by CardRegion(), DoFlash(), Flash(), and StopFlash(). Definition at line 154 of file cardregion.h. Referenced by CardWindow::DistributeStacks(), and Quilt::getRange(). Definition at line 161 of file cardregion.h. Referenced by AdjustPosition(), CardRegion(), CardWindow::DistributeStacks(), and SetPlacement(). Definition at line 159 of file cardregion.h. Definition at line 151 of file cardregion.h. Referenced by GetNumDragCards(), RedrawIfNotDim(), and ZoomCard(). Definition at line 148 of file cardregion.h. Referenced by AdjustPosition(), Clip(), CardWindow::DistributeStacks(), GetNumDragCards(), GetOverlapRatio(), IsPointInStack(), MoveCard(), OnLButtonDown(), PrepareDragBitmaps(), PrepareDragBitmapsThreed(), Render(), SetPos(), and ZoomCard(). Definition at line 162 of file cardregion.h. Referenced by AdjustPosition(), CardRegion(), and SetPlacement(). Definition at line 160 of file cardregion.h. Definition at line 152 of file cardregion.h. Definition at line 149 of file cardregion.h. Referenced by AdjustPosition(), Clip(), GetNumDragCards(), GetOverlapRatio(), IsPointInStack(), MoveCard(), OnLButtonDown(), PrepareDragBitmaps(), PrepareDragBitmapsThreed(), Render(), SetPos(), and ZoomCard().